Adult Wicking Long Sleeve T-Shirt is rated 5.0 out of 5 by 11. Rated 5 out of 5 by fasteddy from HARD-TO-FIND PRODUCT long sleeve t shirt with cuffs I am happy with my two purchases. The fact that I followed the first purchase with a second should sum it up. Rated 5 out of 5 by Skipwebb from $40 Under Armor? I don't Think So These long sleeve Augusta Active Wear wicking long sleeve shirts are inexpensive, they wear great, wash up nice and don't shrink up or stretch out of shape. You can still look good at the gym without spending way to much money for a fancy logo. Rated 5 out of 5 by Tom Wagner from Great Shirt I bought 3 of these just to see how they fit. And they fit really well, and are very light weight. The colors are vibrant too. I wish these came in tall sizes so they were a bit longer. But these will work as is. Rated 5 out of 5 by shipmom from Great shirt! I needed a shirt for a December half-marathon. The emerald green color was perfect for my Christmas running ensemble. It's not an easy color to find. The fit and feel of the shirt was great too! 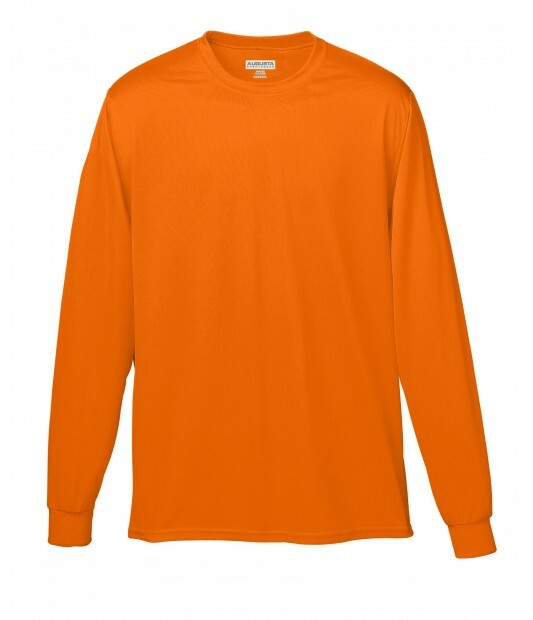 Rated 5 out of 5 by Fish Head from Light weight long sleeve tee shirt for fishing! Bought these long sleeve tee shirts to wear fishing to prevent sun burn. They are light weight and fit good. Glad I purchased and was priced right, they were here in a couple of days. Rated 5 out of 5 by Jomaturino from Great warm ups This is my 2nd year buying warm ups for my basketball team. Great quality for price. Rated 5 out of 5 by Brooklin from Fit the Team great!! I bought these to make warm up shirts for a basketball team and they worked great! What&rsquo;s the difference in the orange colors? Thank you for your question. The orange is darker than the power orange. We only sell the blanks. Our products are not rated for UPF or UV protection.